In Roswell, New Mexico, there’s the Four Paws Pet Pantry, a ministry of St. Andrew’s Episcopal Church. The pet food pantry was created about two years ago and now serves 70 to 80 pet owners on the third Wednesday each month. The congregation has rallied behind the new ministry, and some local school groups have volunteered to help as service projects. 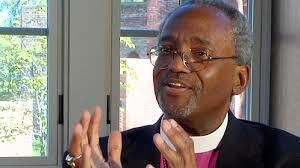 Presiding Bishop Curry: Easter 2018 message from the Holy Land while standing outside of St. George’s Cathedral in Jerusalem.